Marketing is about getting and keeping customers. Effective brochures are one medium. Here are five ways to put together effective marketing brochure ideas. Don’t think print ads still work in today’s digital age? You might want to think again. Experts still believe in the power of print ads, particularly due to their benefits for local marketing. 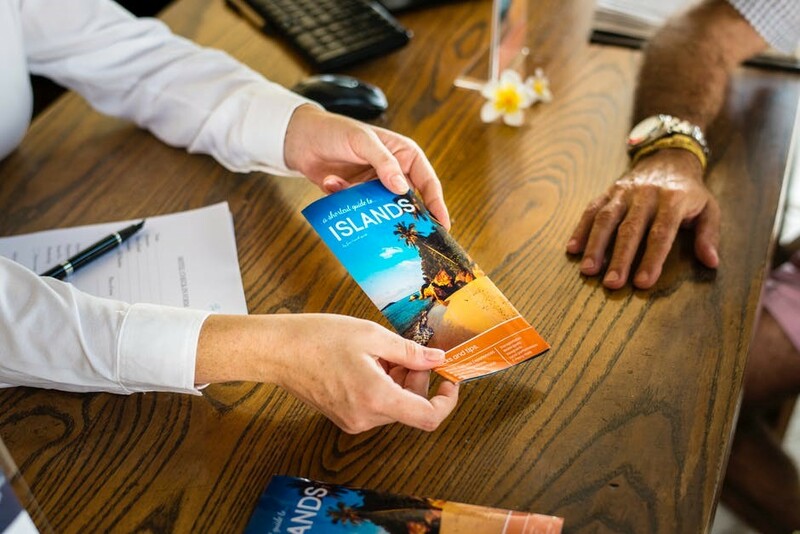 Among the best print ads to rely on, especially to increase brand awareness during tradeshows or street advertising, are traditional brochures. That said, you’ll need excellent marketing brochure ideas to ensure people read what’s on the page. You don’t want to invest so much only to see people pick up a brochure and toss it into the trash can. Don’t fret if you’ve got no idea where to start. We’ve got a list below to help you get a head start! Write your business brochure catering to your audience’s perspective. Start by thinking about the things your readers need to know. The easy way to do it is by discovering the order in how your readers will ask questions. That means your brochure needs to answer their queries depending on their ideal train of thought. Put yourself in their shoes and write down the potential questions your customer will ask. With this information, you can now supply the solutions in your brochure. Your reader will always see the front cover of your advertising brochure. Get the design wrong and it’s as good as a failure. Don’t get tempted to put technical jargon in an attempt to impress your audiences. Think of thought-provoking sentences that can help motivate your readers. Make them know your benefits to help them take the initiative and open the brochure. Make a compelling brochure design using reputable software. Tell your potential readers that there’s exclusive information inside your brochure. Putting your company logo and the business name alone won’t work. It’s especially the case when your business isn’t well-known. If you make your message sound too generic, your potential customers won’t feel special. You need to make your brochure talk to them on a more personal level. Avoid addressing your audience as if they’re a mass of faces. The bottom line is to write in a direct, “I’m-talking-only-to-you” manner. That way, you get a massive increase in response rates from people you’re trying to reach. No matter how you make your brochure, you need to end it with a strong CTA. Give your contact information or any means of responding if you want them to find you. Make sure to stay persuasive while sounding cordial. Get More Marketing Brochure Ideas Today! There are a lot of other things you can do to improve your business brochures. But if you’re in need of marketing brochure ideas, this post is the best place to start. Don’t hesitate to seek out more resources to get the most out of your investments. The most important thing to remember is to keep your business unique. It should show on your brochure design and the content within it. Do you need help making a strategic vision? Read our tips here and learn more today.